I’ve been traveling…again. I’d like to say that I don’t travel often and that I spend the majority of my time behind my computer, never going out to see the light of day. I’d like to say that … mostly because I’m a hard-core introvert who loves spending quality time with the people in her head … but I can’t. If I’m remembering correctly, I’ve been to Uruguay, Cincinnati, and Bermuda this year. And I’ve still got two more trips to go. 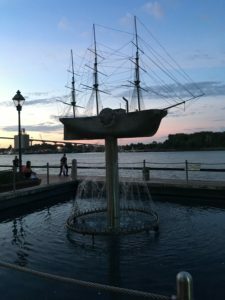 But if you follow me on Facebook, you know that I recently went to Savannah with my husband. You see, he couldn’t go to Uruguay or Bermuda with me (those were trips for the day job). As a result, we planned a quick vacation to the city that we both absolutely adore. Our very first trip together many years ago was to Savannah. And he fell in love with the city too! But that fateful trip wasn’t my first trip to the lovely southern city. I actually first ventured to Savannah a couple years earlier as part of a research trip for a book. You see, Savannah was a major location for my Dark Days series. And I knew if I was going to write about Savannah, I needed to walk her streets and spent some time with her people. I just never expected to fall in love. I have enjoyed three trips to the city. Each time I like checking out the little changes and developments they’ve made, while at the same time remarking on how so many of the big things (such as the beauty of the historical homes and the welcoming charm of the people) never change. It’s a city that I can’t imagine ever growing tired of. But I am willing to go again and again and again just to see if it’s possible. 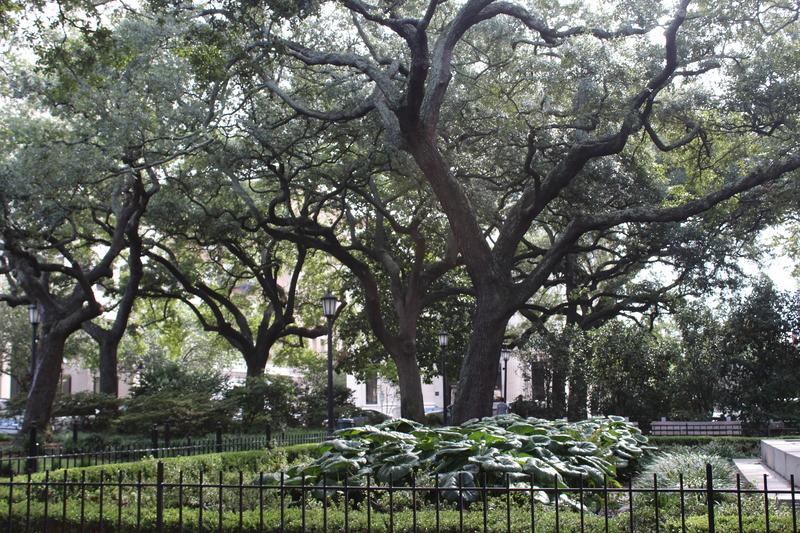 For me, I think one of the first things that stands out is that Savannah is the land of the trees. In particular, the live oak. These trees are absolutely massive with giants limbs that stretch out in all directions, offering up the most wonderful shade on a hot day. These trees beckon you to sit under them and stare up at glimpses of blue sky between the leaves. You can just sit on a bench, your legs stretched out before you, and enjoy a little peaceful people watching while letting your mind amble down one path after another. These are the trees exist the sole purpose of daydreaming. 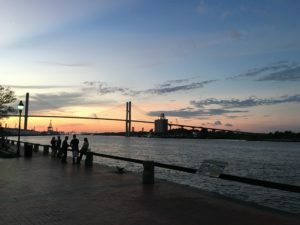 If you’ve never made the trip to Savannah, let me give you a bit of a tour of one of my favorite places in the world (and keep in mind that I have been to Paris). 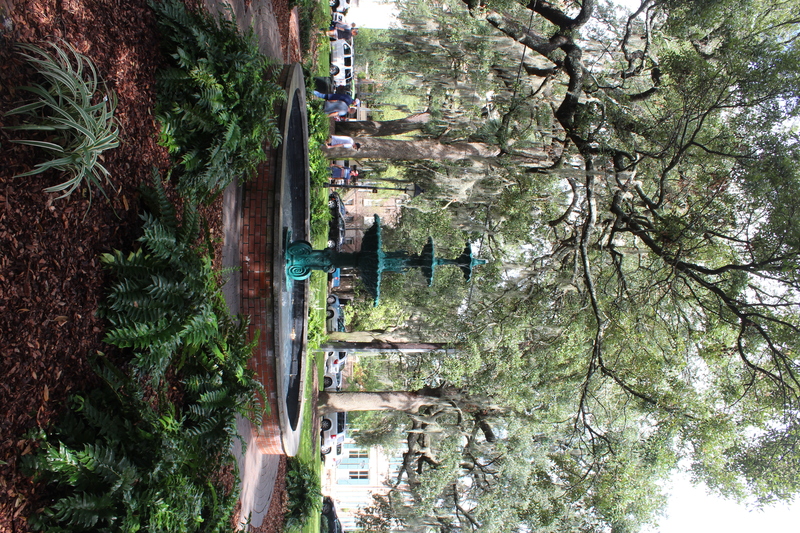 Established in 1733, Savannah is a town that oozes history from its very pores. From the birth of our nation to present day, the city’s history and the history of our nation (both good and bad) can be found at every step. Embrace it and trust me, you’ll find yourself enamored. 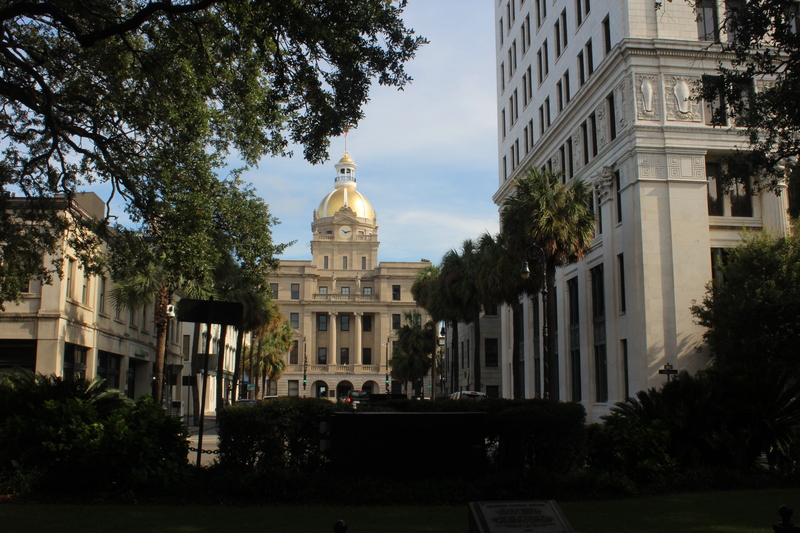 Built on a grid system, historical Savannah is actually quite easy to navigate. Bull Street runs up the center of the city from north to south, acting as the dividing line between east and west halves of the city. Because of the hotel I tend to pick each time I’m in town, we start our walking tour at the river on River Street. And as you can see, it’s a pretty awesome place to take a stroll as the sun is setting. Our first night in town, we had dinner along River Street. 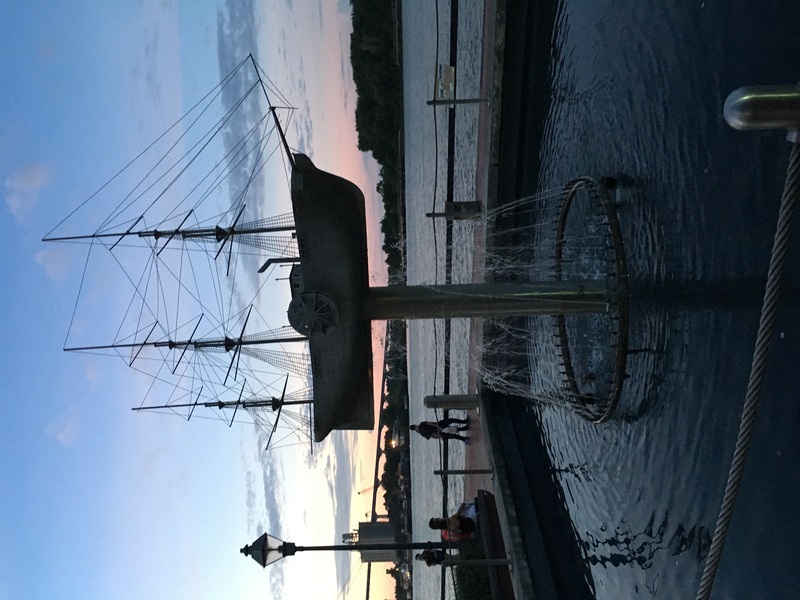 We then slowly strolled from one end to the other, checking out each of the historical memorials that dotted the path, enjoyed the beauty of the sunset, and listened to the various performers. In short, it was a peaceful and perfect way to start our vacation. 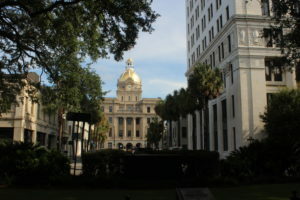 We headed out from River Street, moving south along Bull Street and visiting each of the squares that dot our path. 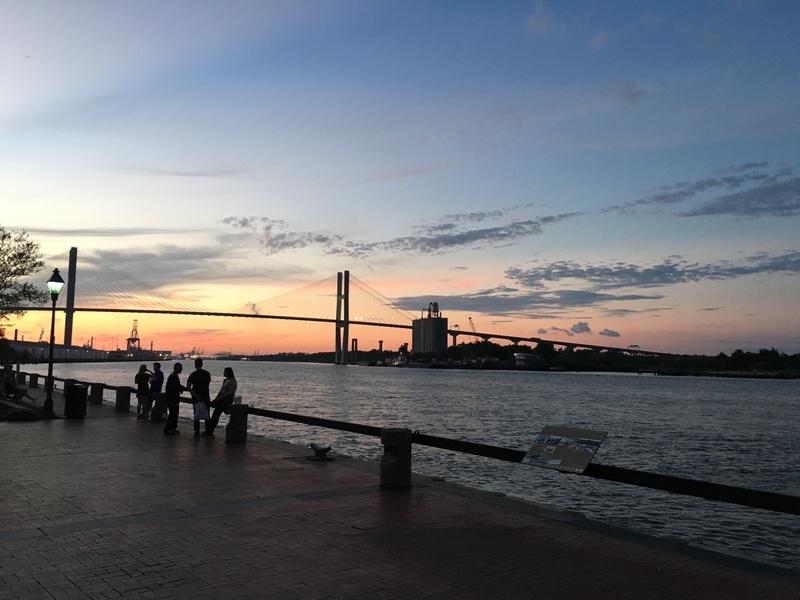 And that is something you will love about Savannah. The city has a deep respect for green space. The city has 22 squares spread at regular intervals. And if you following along Bull Street, you will eventually hit Forsyth Park. Now each of the individual squares is lovely. 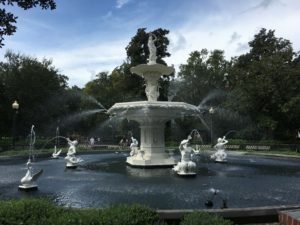 Some are more ornate and elaborate than others, but they are all a great green space to relax and escape the heat of the day under a giant tree while chatting with a friend or reading a book. 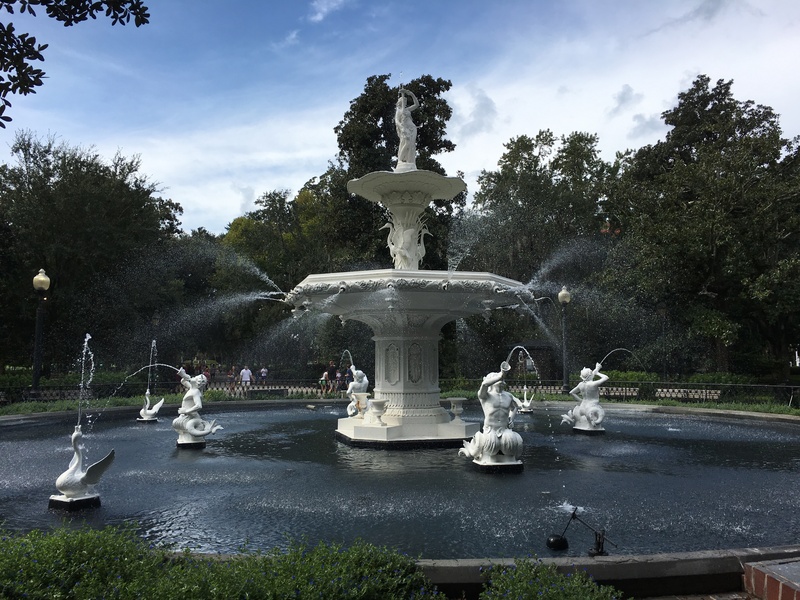 But the crown jewel of green spaces is Forsyth Park. 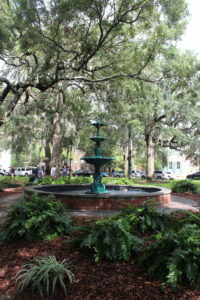 Many times larger than the squares, Forsyth Park has a place for children to play and a small restaurant, but the thing that everyone comes to see if the large white fountain at the end of a tree-covered path. 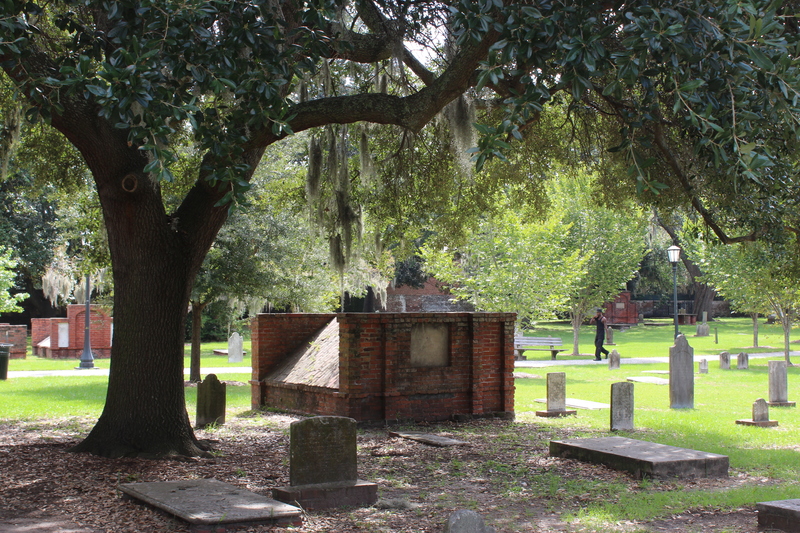 On the east side of the historic district, you will find the Colonial Park Cemetery. Yes, I know it’s no surprise that I found my way to the cemetery. While it’s not Savannah most famous cemetery, it is worth a visit. Many of the headstones are so old and weathered that the names and dates have been largely worn away. Also as a side historical note, back during the Civil War, soldiers had to billet one winter in this cemetery. As a way of amusing themselves, soldiers pulled up many headstones and used them for target practice. Others changed the dates that some people died before they were born. 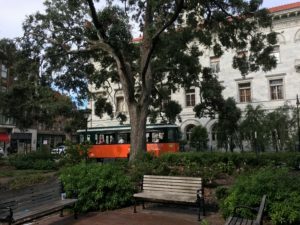 If you haven’t figured it out, Savannah is a walking city. On the first day, we covered about seven miles and that was with ample breaks. On the second day, it rained a bit and we were lingering in the squares a little longer. As a result, we covered only 4.5 miles. 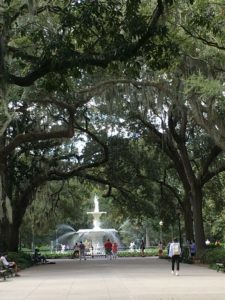 However, one great way to see Savannah is through one of the many tour groups. Several trolleys run through the historic district each day. Buying passage on one not only gives you on-and-off privileges all day but the driver provides some great stories about the city. But the tour aren’t just for the day time. I highly suggest that you also check out the ghost tours. A city this old, you know it’s got to have a ghost story or two or a hundred. 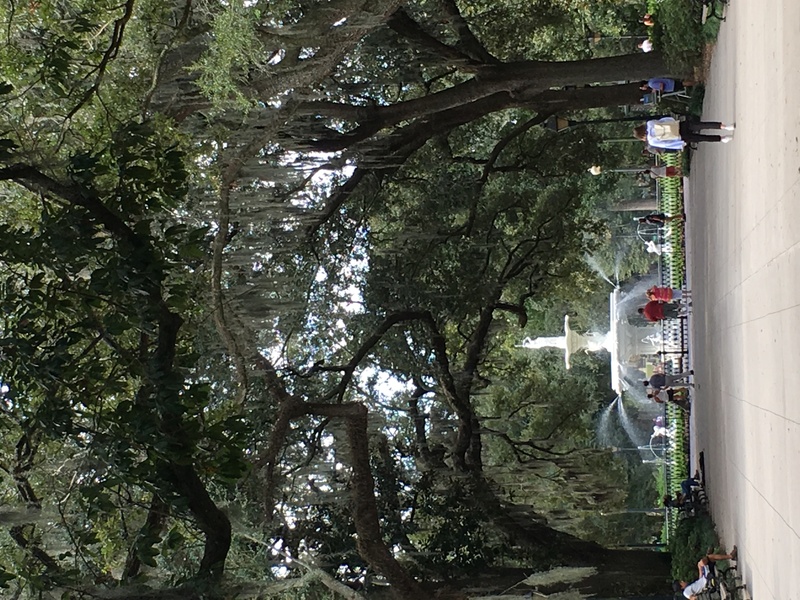 Yes, Savannah is ranked as one of the most haunted cities in America. And you don’t even have to believe in that sort of thing to absolutely love the tours. Go for the nighttime spooky stories. If you can’t tell, I love Savannah. It’s currently at the top of my list for where I want to move next. And it’s also at the top of my list for places I want to feature in a book. I’ve already started the process of nudging and wooing Rinda to the idea of new books set in this old city. Trust me, it’s a place made for mystery, magic, and romance.